Oftentimes QuiBids customers come to our site in search of flashier, exciting products like golf clubs, televisions, and anything and everything manufactured by Apple (though at the moment all we’ve got is iPads — sorry ’bout that). What these people typically don’t realize is that shopping with QuiBids is a great way to save money purchasing your essential needs, not just the latest and greatest in doodads and fancy electronics. Several of these more basic, necessary items draw much less attention, and often go for much cheaper than comparably-priced stuff. 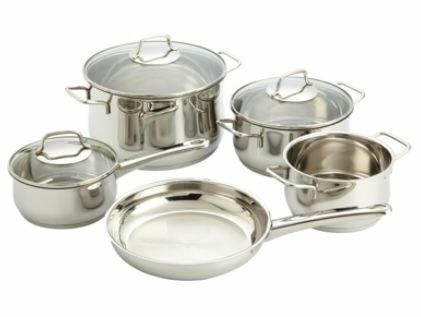 Case in point: the WMF Collier 8-Piece Cookware Set. We tracked down the numbers on the last 32 auctions for this particular item and we thought the results might help you out in your next attempt at snagging it. We’ve broken them down into the following categories: final auction price, savings, and bids spent, each with a listed average, range, and median. It should be noted that some of these cookware sets are valued at slightly more than the others because they came with an additional 20 Voucher Bids. It’s also worth noting that several of them came with a 1X Gameplay, which, while not increasing the item’s retail price, may have increased (or decreased) customers’ willingness to bid on the auction. Minor X and Y factors, if you will. While the range of the cookware auction spanned just over eight dollars wide, just as many auctions stayed under $1.63 as exceeded that number. Something worth keeping in mind as you watch the price go up in the next auction. It’s also definitely worth noting that the highest final auction price in the range qualifies as an outlier, as the nearest two prices were $7.20 and $4.12. The winner of the $8.29 auction (who also spent 242 real bids, as you’ll notice below under bids spent) still purchased the item for $58.50 less than retail, at 28% savings. Also also, just for fun, if you remove the two outliers (the $8.29 auction and the $7.20 auction) from the equation, the average final auction price drops much closer to the original median, all the way to $1.75. In my opinion, the median’s a more reliable way of gauging just what your odds of winning an auction are before placing a single bid. Here, you’ve got a 50% chance of winning if you’re willing to chase the item all the way up to $1.63. It helps here to keep in mind that almost a third of the cookware sets came with 20 Voucher Bids, increasing their value price from the standard $199.99 to $211.99. Not an enormous difference, but it does help to explain the less than $4 difference between that standard price and the median savings. For the sake of clarity, these numbers don’t distinguish between Voucher Bids and Real Bids. However, it’s definitely worth noting that only five of the 32 winning bidders used a combination of Voucher and Real Bids to win the cookware set. The 27 others either stuck either exclusively with Voucher Bids (the most used to win was 47) or Real Bids (the most used to win was 138). Well what are you waiting for? Take your newfound knowledge out to the auction block, ‘cause we’ve got five more of these things that are reaching the end of their timers in the next seven hours or so. And be sure to let us know how you do in the comments. Happy bidding!